f.15 Fortress on a hill. bl.uk > Online Gallery Home	> Online exhibitions	> Asia, Pacific and Africa Collections	> f.15 Fortress on a hill. 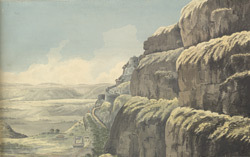 Water-colour painting of a fortress on a hill by John Johnson (c.1769-1846). This image is from a sketch-book of 36 drawings depicting scenes chiefly in West India and Mysore, c. 1795-1801. Johnson served with the Bombay Engineers, chiefly engaged on survey work. During the third Mysore War (1790-92) he was with the Maratha and Bombay armies and surveyed routes from Poona to Dharwar and later in Malabar and Mysore. From 1792 to 1799 he was on survey in Malabar. During the fourth Mysore War (1799) he surveyed the Bombay Army's route to Seringapatam and during the siege he was employed in the north batteries under Colin MacKenzie. He was on survey work in Goa in 1800 and in N. Kanara 1800-01.